Instead of thinking in old world terms like Operational and Business support applications and systems, the era of Digital Support Systems powered by Smart Data has arrived. Achieving profitable transformation and commercial success depends on providing the right answers. Utilities’ commercial and operational infrastructures are fast evolving. There is broad agreement that the Internet of Things (IoT) and digitization are altering the competitive landscape in significant ways. But despite eagerness to take up the new technologies, many utilities are finding success elusive. On the other hand, some companies are leading the way. One example is the Swiss utility Alpiq and another is the Nordic leader, Fortum. Both are already deploying new backbones to launch innovative services and manage their resources more profitably. Reflecting the broader industry change, analyst firms have shifted their IoT focus from ‘what is it?’ to ‘how does it work?’ The results of their research holds a mirror to the maturation of the IoT market. An example of this comes from industry research leader Gartner which now publishes an IoT ‘Hype Cycle’. Along the Hype Cycle’s curve, IoT’s stages of development are represented: Innovation (early stage), peak of inflated expectations (think maximum hype), trough of disillusionment (reality hasn’t caught up! ), slope of enlightenment (we’ve finally got it) and plateau of productivity (we have lift off). In the IoT Hype Cycle, the sort of aspects charted include: IoT Business Solutions, IoT Platforms, IoT Architectures, Event Stream Processing, Machine Learning, Predictive Analytics, IoT Integration and more. This gives us a window into what common aspects are required to ensure that IoT delivers. That commonality is shared by individual operational challenges that both include and extend beyond the core IoT elements that Gartner has focused on. Consider new technologies like, for instance, the distributed ledger function Blockchain and we see that the same underlying challenge that appears everywhere else becomes apparent if Blockchain is to deliver. In a nutshell it’s this. The fuel of progressive operational infrastructure and service innovation is data. Why? Essentially, because new technologies may confer the ability to be smarter and more profitable than those they’re supplanting but the smartness is dependent on the quality of the raw data they rely on to guide their decisions and behaviors. An IoT platform or digital strategy that relies on less than optimal data feeds (roughly in terms of time, volume and clarity) is no more useful than a Ferrari with an empty tank. Another metaphor: It’s the data that lets Machine Learning learn. My own experience makes the precedence of data obvious, something that may or may not be clear within Hype Cycles or other research but which becomes unavoidable if you’re standing on the front line of digitization. For companies executing IoT strategies (rather than talking about them), there is a growing understanding that the key requirement isn’t in mastering the new digital technologies that IoT brings but in understanding your own business experience more exactly. Only when you have mastered your own organizational processes and goals (information contained in your enterprise data) can you work out how IoT can help you and, by extension, know what data you need to drive your strategies. Then, of course, you have to make sure you can access it. Effectively leverage new network technologies. Create desirable new business models. Let’s look in a little more detail. To build the new operational infrastructure required by IoT, and more generally digital transformations, requires a foundation that extends beyond a legacy infrastructure composed of a complex stack of static, inter-dependent applications not originally designed to support new ways of doing business, especially those that place a premium on speed and flexibility. Understanding events in real-time and being able to access and analyze data quickly has now become vital. Utilities today must shift to a data-driven IT architecture that is responsive to customer needs and supports both new technologies (like the aforementioned Blockchain) and fast new service rollouts. The requirement is for a versatile data integration engine that interfaces assets, market, customer and partner information as well as data from new connected devices. The sharing of data between business segments. A control point from which data can be used to secure iterative evolution and secure IT transformation, preventing locked-in dependencies. Real-time data visibility and control, supporting the prosumer customer journey. Carrier grade scalability and reliability to guarantee access to all vital data, at any time in real-time for mission critical business. Innovation today requires a control point applied as close to the data sources as possible. This must preserve existing data flows but at the same time allow new applications and services to react to new data in different ways. Implementing this allows the utility to more quickly provide new services and introduce innovative business models in meter-to-cash processes. It shields legacy IT investments from changes which drive up incremental costs. It enables new ways of interacting with customers and at the same time identifying and extracting monetizable events. It creates smarter business intelligence based on real-time data availability. To return to the Hype Cycle, it’s not an exaggeration to suggest that the vast majority of the individual components of IoT and digital success are dependent, first, upon answering these questions of data. To invest or pursue a digital strategy based on legacy IT foundations and architectures is to at very best ensure only limited success. How can I offset the exponentially increased cost of new ways of doing business by maximizing the performance of my network assets as effectively as possible? How can I overcome the limitations of siloed data sited across assets that result from a legacy IT that may prevent me quickly accessing data I now find is critical? How can I manage network assets in a way that ensures new services can be identified and launched quickly enough that I can lead the market, instead of reacting to the strategies of my competitors? 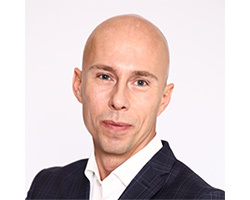 Jonas is Head of Business Development, Utilities at DigitalRoute. He has been at the company for over a decade in various roles covering both technical and commercial perspectives, ensuring successful rollouts of global solutions and introducing state of the art technology to customers in over 50 countries. A technical evangelist, Jonas has contributed his expertise at DigitalRoute in a host of ways including market exploration and aligning software to long-term trends, ensuring the technology is focused towards successful company growth and direction. We need to know what the technological world has to offer us. Some are basically hearsay or technologies that are still developing. Due to demand, many companies are trying to sell something that isn't even concrete yet. Therefore, we need to really find out what we need and what is capable of feeding our needs.